I enjoy Biblical fiction, I have thoroughly enjoyed many many different forms of Biblical Fiction. As believers however, we need to make sure we line up any fiction we read with the Bible. We need to keep these and other fiction books in their place, which is second to the Bible and not a replacement for it. 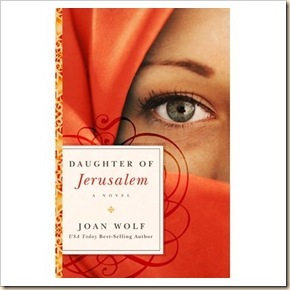 Daughter of Jerusalem is the story of Mary Magdalene, written by Joan Wolf. This book tells the story of Mary beginning when she is a young woman and ending after Jesus’ resurrection. I thoroughly enjoyed the story that Joan Wolf wove from the few details we have about Mary Magdalene from the Bible. I felt like I really could envision what life was like when Jesus was walking the earth. Understanding the way the people related to each other, and how life was lived back then, is fascinating to say the least. The people were such a close community and really depended upon each other for so many areas of life. I loved how there was a big focus on how Jesus related to women, from the woman at the well to Mary and Martha. My favorite thing about this story was showing what may have driven Mary to seek out Jesus and to follow him. We all have sins we try to hide from others eyes, but Jesus can see through to who we really are. This was a good story to remind me of who Jesus is, what he stands for, and how he loves all of us. I have two FREE copies to give away from Worthy Publishers!! Leave me a comment of what character you would want to read a Biblical Fiction story about and you might get a copy sent to you!! NOTE : I was offered a copy of Daughter of Jerusalem in exchange for an honest review by Worthy Publishers.